I’ve seen some weird and embellished mugs before, but this OPMOD Battle Mug is in a whole new league of excessiveness. 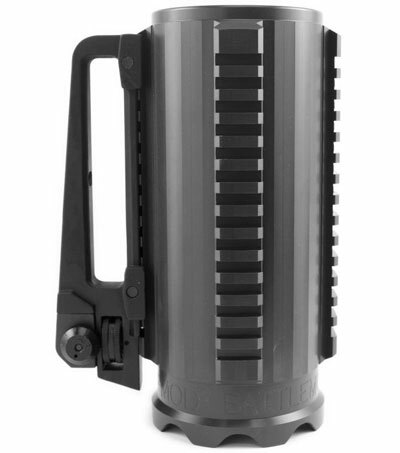 The 24-ounce mug itself is machined out of a solid aluminum block that starts off at 13.5 lbs. On top of that, it features 3 functional Mil-Spec 1913 scope rails. The handle? A removable AR-15 carry handle that’s mounted to one of the rails. This is a neat accessory or collectible for enthusiasts. Excessive, yes, but cool nonetheless. The OPMOD mug is priced at $250 but at least ships for free. « Is This Armed Robot Walker the Greatest Toy in the Universe? $250 for a mug? Seriously? It looks tacticool and all but $250?